So you Start dedicated servers enable you to take up to 128 failover IPs as an option. 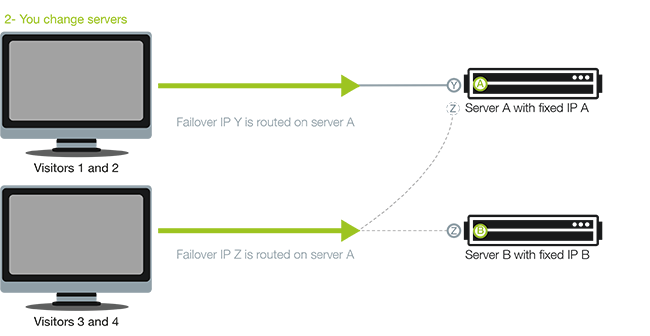 It only takes a few seconds to switch a FO IP or an IP block from one server to another. These IPs allow you to avoid the interruptions that could lead to hardware failure, overload or any other kind of issues on your infrastructure. *Slots represent the number of routers available for routes addressing your IPs and IP blocks. A slot can have 1 IP or 1 block of several IPs. Limited to 16 slots and/or 128 IPs per server. **Except for any IPs included with your server. Make sure that your hosting system configuration is based on the failover IP and not on the fixed IP address of the server. This way, the entire configuration linked to the FO IP will be saved when moving to another server. During this operation, you will need to copy your configurations and projects to the new server. As the configuration is linked to the FO IP, there is no need to reset everything on the fixed IP of the new server. The configurations and data are identical: everything will work as before. In this example, your data is hosted on dedicated server A (with fixed IP A), and configured to failover IP Z. If server A is no longer powerful enough to host your projects, then you can order a new server: server B, with fixed IP B.
a) You first need to copy the data and configurations files from server A to server B.
b) Then you switch the routing of FO IP Z: from server A to server B. Your configuration files, as well as your data, run on the new server (B) and are then linked to the FO IP. SMTP, POP3, Apache, DNS and MySQL configuration will not change. In this example, your have two servers: a main server (server A) and a backup server (server B). Your data is configured on failover IP Z and routed on server A. You regularly copy your projects from server A to server B.
a) When server A is down, you can switch the routing of failover IP Z to server B. All your services will work on server B while server A is being repaired. b) As soon as server A is up again, simply copy your data from server B to A and switch the failover IP routing back to server A. If you host multiple websites, you can use 2 failover IPs and some of them will be assigned to failover IP FO Y and others to IP FO Z. When server A isn't powerful enough to host the websites of failover IPs Y and Z, you can order a new server B and switch the failover IP Z routing to server B. Server A won't be hosting the sites for failover IP Y any more, resulting in decreased load and improved performance. If you host international projects then search engine optimization (SEO) will be of great interest to you. The ranking of many search engines is directly affected by the location of the hosting IP address. So you Start enables you to host a project on server A with failover IPs located in the US and in Canada. 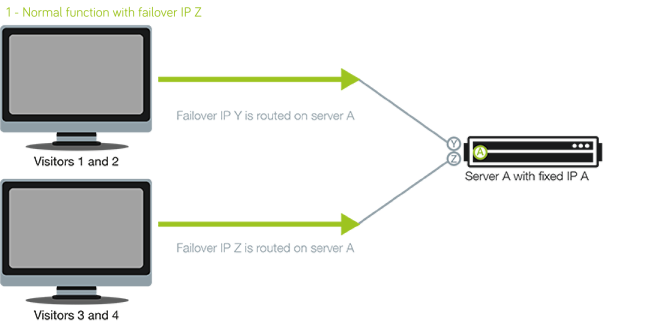 Failover IPs are a unique technology developed by OVH, which the SoYouStart servers can also benefit from. The SoYouStart failover IPs are compatible with all SoYouStart servers. They can be migrated from a SoYouStart dedicated server to an OVH dedicated server. However, the opposite does not apply: failover IPs cannot be migrated from an OVH dedicated server to a SoYouStart server.